A training gem I picked up many years ago from Patti Hatfield Mah was that our seasoned dogs still need to have baby dog training days. Pick one day a week where you go back to training your foundations skills. Foundations is everything! Without a strong base, continuing to more advanced skills will leave gaps and create training and trialing issues. Think of it like causing structural damage to your base! When a gap does show up, and they will, go back to make your foundation stronger! By planning for weekly foundation training days, you will better prevent those gaps from forming in the first place! For Agility, open up your weaves to make a small channel and work on entries and speed. Use your stairs or the end of your dog walk plank to revisit your dogs 2off/2on skills. Do some beginner jump grids setups. For Nosework, go back to single hide placements and well vented containers. Increase your odor strength so that it “pops” and grabs your dogs attention. Revisit your early foundation games – the shell game for high rate of reinforcement and rapid feeding at source to build value for source and confidence in the game. For Obedience, bring out that pivot bowl/disc and work on rear end movement. Bring out props and platforms to practice accurate positions. Do signals up close. How’s that fold back down doing? Review their “hold” on dumbbells or gloves. Play marking games to stanchions and gloves. For Tracking, lay a scent circle or stomp out a pad to find treats in grass. Work on article indication and multiple start flag setups. You can even work on YOU. Your training mechanics, foot work and handling moves! Are you being clear and consistent with your dog? We can too easily push our dogs for more and more, not giving them enough breaks or maintaining their foundation or clear understanding of our training concepts. The world we live in today promotes instant access, and the desire for quick results. We can too easily rush the journey and not relish the time it takes to build strong behaviors and accurate performances. There is great satisfaction in developing strong understanding and confidence in what we train our canine companions to do. I relish baby dog days as it reminds me we always want to strengthen our foundation to avoid the structural cracks! When was the last time you did a baby dog training day? Excellent advice. 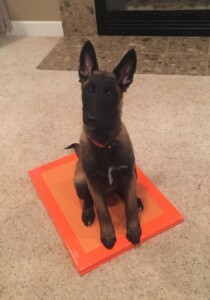 I tell my students to never be afraid to go back to the basic fundamentals of any sport as it reinforces training, almost guarantees success, keeps the dog strong and, according to some experts, my canine physical therapist is one, helps prevent injury by keeping the dog sharp. Thanks for this post. Thank you for this advice. So often we lose sight of the basics. Thank you for sharing this with us!